I am offering private lessons in all aspects of making, trimming, decorating, glazing and high- firing of utilitarian pottery, $50/90 minutes of instruction and practice time, plus up to two hours the following day to trim your pots. This is an opportunity to learn and participate in the entire process of pottery making and firing with a veteran potter with 37 years of experience. Students will work, and lessons will be given on a back-saving standing wheel, and must be at least 17 years of age to receive instruction. Practice time for throwing, decorating, glazing etc. will be offered weekday afternoons by appointment @ $10/hour. High-temperature electric oxidation will be the primary firing temperature and method, and reduction and soda kilns are available. Students may be offered the opportunity to participate and experience in these types of firings. 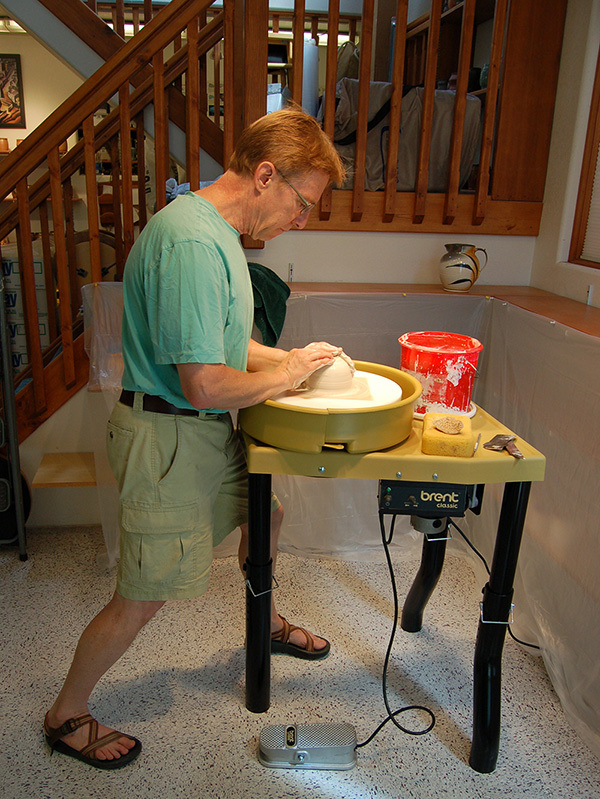 Beginners are welcome, as are potters wishing to take their work to the next level. Production potters are not welcome. Commercially produced porcelain will be available for student use at $.45/lb. Handmade stoneware and white stoneware clays may be available at various times. Glaze and material costs depend on the amount and content of the materials and glazes used. Students must provide their own tools, clean up after themselves, and help maintain a clean and organized private studio. High temperature firing costs of electric, reduction and soda kilns are determined by the volume of pieces to be fired @ $26/cu. ft. In addition, considerable work is involved in the firing of reduction and soda kilns, including making cone packs, wadding of pieces for soda firings, loading, firing, unloading and cleanup. Students who are offered the opportunity to participate in reduction and/or atmospheric soda firings are expected to help with their time and energy. I expect help loading the high-fire electric kiln for glaze firings of student work. Electric kiln: (cone 10 oxidation), 7 cu.ft., (computerized kiln), Advancer shelves. Firing cost: $26/cu.ft. Electric bisque kiln (cone 08 oxidation), 11.7 cu.ft., cordierite shelves. Firing cost: $12/cu.ft. Reduction kiln, (cone 10-11 reduction), 36 cu.ft., cordierite shelves. Firing cost: $26/cu.ft. Soda kiln, (cone 10-12 atmospheric), 19.4 cu.ft., nitride bonded SiC shelves. Firing cost: $26/cu.ft. Call and let’s get started! 303-665-6925.